As the end came rushing in for Lucas Matthysee after the third knockdown he suffered from Manny Pacquiao at the Axiata Arena in Kuala Lumpur, the famed hard hitting Argentinean spat out his mouthguard. 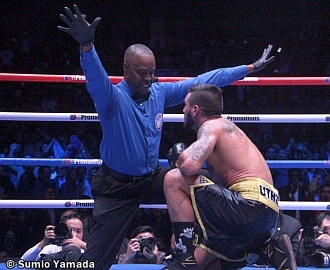 The very act of doing so signaled referee Kenny Bayless of Las Vegas to wave off the fight. Thus, Pacquiao scored his first knock out win in 9 long years since putting down Miguel Cotto at the MGM. Matthysee’s act was a clear signal that he had enough and it was futile to proceed with the fight and get hurt needlessly. Since the act of surrender came in with the mouthguard being spat, many pundits and fans alike after the fight peppered this writer about the incident knowing that he designs and fabricates Manny Pacquiao’s mouthguards. Many questions were asked but the most prevalent was “Will Pacquiao be able to do the same assuming that he was in the same deep trouble like Matthysee? The answer is an unequivocal no! There is no way Pacquiao could have done the same even if he wanted to do so. He would not be able to push his mouthguard out with his tongue. 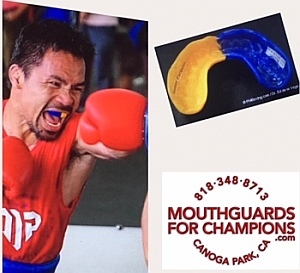 Pacquiao’s mouthguard are custom-designed and fabricated in such a way that he needs someone to physically remove it. This is true for the many we have fabricated for him for more than a decade. For this fight, Buboy Fernandez was reminded by this writer who is acting as Pacquiao’s cutman for the Matthysee fight, how to quickly and efficiently remove Pacquiao’s mouthguard between rounds. In fact, long after the fight was over and the ring celebrations started, Pacquiao was proudly celebrating around the ring still wearing his mouthguard. He did so until I personally got a chance to get near him and physically remove it. In all honesty, there is no need to really remove the mouthguard between rounds. The design and fabrication is so precise that Pacquiao could have kept it in between rounds. But Buboy Fernandez removes it any way perhaps to satisfy a Pacquiao habit acquired dating back before we got involved with his mouthguards. Incidentally, the removal of the mouthguards between rounds is often seen being done by many boxers even to this day no matter how comfortable and correctly fitted they maybe. This is a myth and a habit is perpetuated by the lousy mouthguards of old as well as the poorly made ones less-informed boxers use. Many of these are the DYI boil and bite type and the stock mouthguards available for a dollar at sporting goods store and via the internet. These mouthguards fit so bad that fighters ask that they be removed between rounds to give them a respite from the discomfort of wearing them for three long minutes. For a few years now, we had been telling boxers we make mouthguards for that there really is no need to remove them between rounds. Lately, many had listened to our advices. Foremost of these is incumbent world super flyweight title-holder Jerwin Ancajas. Ancajas first used our mouthguards in a title defense at Corpus Christie Texas against Israel Gonzales. He felt so comfortable with it that he never took it off between rounds. His trainer Joven Jimenez told us that Ancajas never asked that it be removed between rounds. It is now a routine for Ancajas to keep his mouthguard from start to the end of his fights. In fact he did the same when he fought Jonas Sultan for 12 rounds at the Save Mart Arena in Fresno, California last May 2018.